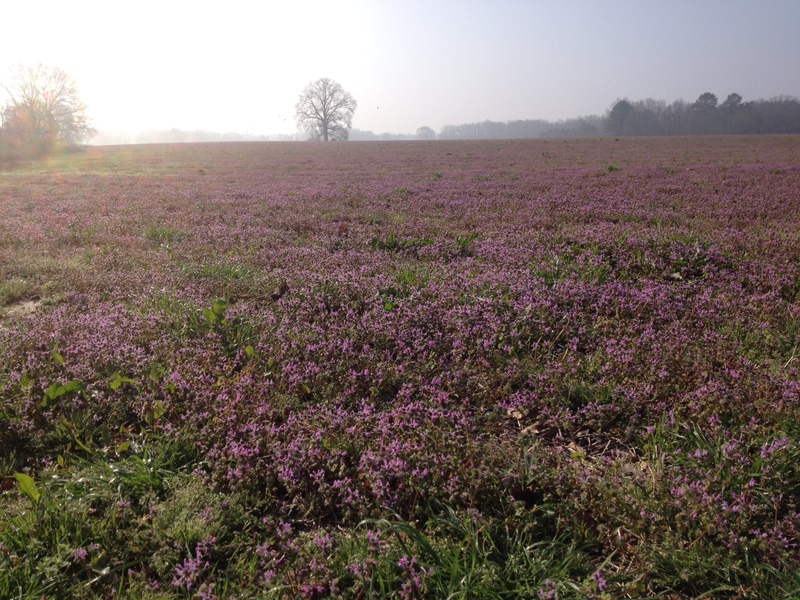 On Monday, on my way to Starkville to attend the Gaining Ground – Sustainability Institute of Mississippi board of directors meeting, I saw a giant field of henbit. I immediately pulled over and took a photo, because this often overlooked and unassuming plant is quite important to bees, hummingbirds, and — should be! — humans. What a wonderful sight!!! For hungry bees, butterflies and hummingbirds this late winter, early spring “weed” is a godsend for its pollen and nectar. At this time of year, when bees are foraging for pollen and nectar to stay alive, with their stores of honey from last year often depleted or dangerously low, henbit supplies needed sustenance. Regular readers of this blog, perhaps, recognize that I’m something of a fanatic on this subject, as every year I urge farmers to please refrain from plowing under their henbit as long as possible, or spraying pre- or post-emerge herbicides. The bees will thank you! In a few weeks, or now in some parts of the South, hummingbirds are making their way back north from the winter, and henbit provides an abundant supply of nectar for them, too! It might not be a part of official farm policy to provide food for pollinators, but this humble little purple plant (a member of the mint family that tastes like kale) can be a tremendous food source. Humans can eat henbit, too. The stem, flowers, and leaves are edible. It’s high in vitamins and you can cook it or eat it raw in salads, or make a tea from it. According to naturalmedicinalherbs.net it has medicinal uses, including antirheumatic, diaphoretic, excitant, febrifuge, laxative and stimulant. So, if you see it growing in your garden and think, ack, what a noxious weed! Think again! This is a beneficial plant for pollinators that can spell the difference between life and death for some. Jim PathFinder Ewing is a journalist, author, and former organic farmer now teaching natural, sustainable and organic agricultural practices. His latest book is Conscious Food: Sustainable Growing, Spiritual Eating (Findhorn Press). Find Jim on Facebook, follow him @EdiblePrayers or @OrganicWriter or visit blueskywaters.com. Everywhere I go, it seems, I bump into people who say, “I read your blog…. Have you planted your garden yet?” And I have to tell them: No, it’s still too early in central Mississippi. Traditionally, down here anyway, the time to plant seeds was done by the moon, and around Good Friday. For more than 30 years, I’ve always planted the week after Easter because we more often than not have a cold spell right at Easter, and I’m fairly assured that the crop will do well if planted afterwards. 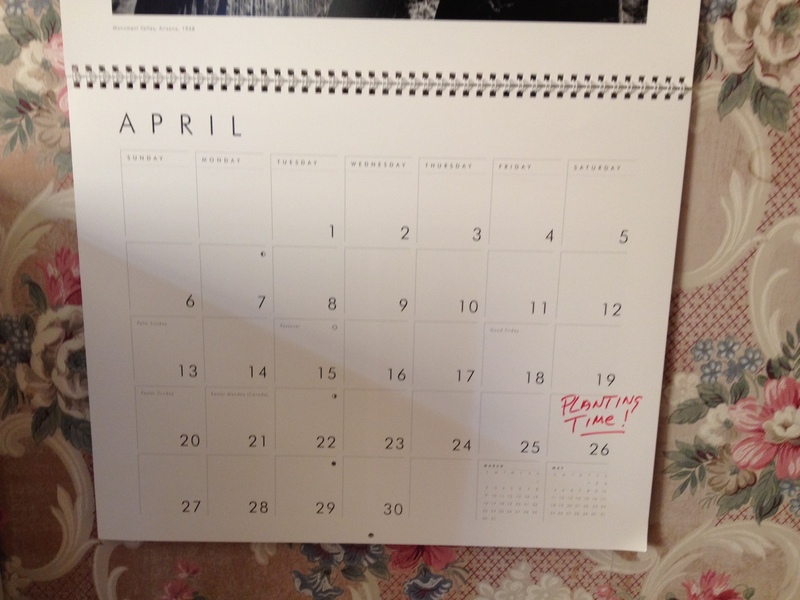 This year, Easter is April 20. So, I’ll probably plant the weekend after, or around April 27. The past two years, we’ve had warm winters, leading people to believe they can plant earlier than normal. (Although last spring was cold and rainy which didn’t do well for early planting.) Normally, April 15 is considered an early planting time. But the year before last, I probably could have planted in February and it would have done OK.
You want to plant as early as you can past the last frost, but not so early that the soil is cold and your seeds or plants just sit there and possibly rot in the ground. Here’s a pdf frost chart for Miss. : http://bit.ly/f8QSAb. For all states, see: http://bit.ly/i5SmsT. As you can see by the chart, it’s a gamble to plant this time of year. As the chart shows, on March 23, for example, for Jackson, MS, it’s 50-50 whether the temperature will drop to 32 degrees and 90 percent that it will go down to 36 degrees. It’s only 10 percent, though, to reach 28 degrees. How lucky do you feel? Sure, we could have a warm month and you would be fine. But we could just as equally have an ice storm. Or one killing frost between now and Easter (which often is the case). I’d just as soon not take the risk of having to reorder all my seeds or worrying if my plants were stunted, and would rather wait a little a bit to plant. It’s true that organic growers want to plant as early as possible to get a headstart on the bugs; a luxury that people who spray poisons can avoid. But having the first tomato on the block is not that important to me; having a good, healthy stand of tomatoes is much higher on the personal scale of priorities. Most seed packets specify the proper soil temperature for sowing. Some plants do OK in cooler soils; some don’t. Garden Has Too Much Compost? Or Not Enough? Just finished reading a fascinating article on soil fertility by Jon Frank (ACRES USA, Dec. 2013) that notes that gardens can “abused” by too much compost. Is there such a thing? Conductivity: 400-600 micro Siemens/centimeter — and he gives amendments necessary to correct that (for more, see the article). I say it’s a fascinating article because, honestly, after wracking my brain, I can think of few gardens that suffer from “too much” compost. I do remember one friend’s garden that I suspect was “too much.” The soil was so moist and rich that it probably could have served as a worm bed for all its amendments. But even Frank notes that the solution to a garden “abused” by too much compost is simply to grow more without adding more. Maybe “abuse” is too strong a word for the issue of adding compost. Additionally, given the fact that it takes so much raw vegetative matter to create so little “black gold,” I doubt too many gardens are approaching the “abuse” stage. Nonetheless, the figures Frank gives are instructional. Looking at the soil report I obtained for my garden from Mississippi State Cooperative Extension Service (see earlier blog), I can see that there are some interesting figures that conflict with Frank’s interpretations. Potassium – 156 lbs per acre (MSU: low) – Frank says this is just below the 200-300 pounds that’s ideal. Again, I suspect that compost will raise that. Calcium – 3706 lbs per acre – Falls within perfect number for Frank and within the proper ratio to Magnesium he gives. Everyone who has a garden/farm and pays attention to soil tests probably has his/her own ideas about what the proper ratios should be and how to go about fixing them. 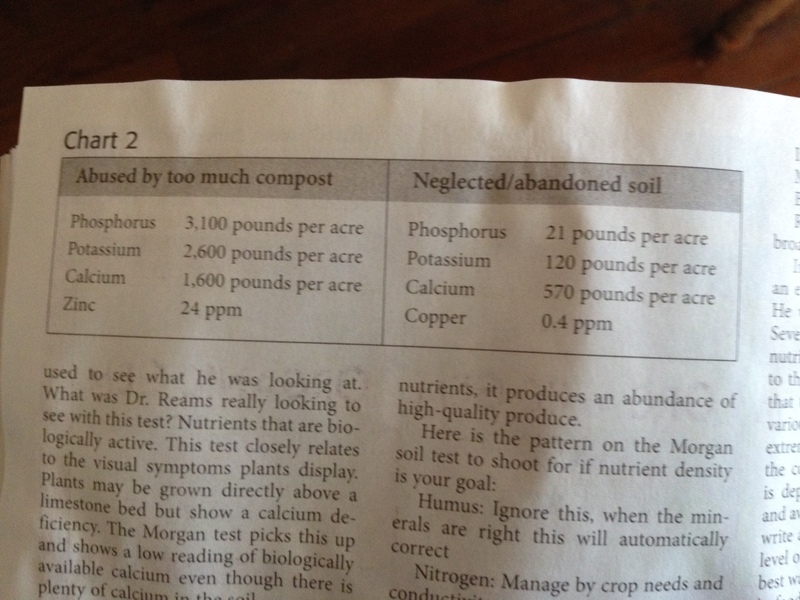 MSU, in my soil report, for example, suggests 34-0-0 pre plant (high nitrogen) fertilizer and 0-0-60 (high Potash) fertilizer — synthetic chemicals. In my opinion, shared by most organic growers, such a course of action would burn the soil, killing earthworms and microbes that keep the soil environment healthy. Rather, what I intend to do is plant the seeds with a fish emulsion to provide nitrogen, then side dress (adding more natural liquid fertilizer) and foliar feeding after the plants are up. In addition, I plan to plant clover between the rows and on unused soil to build nitrogen for my fall planting. I would say that I disagree on his view on humus; in my opinion, developing proper humus ensures better availability of nutrients, which is what he’s aiming at. 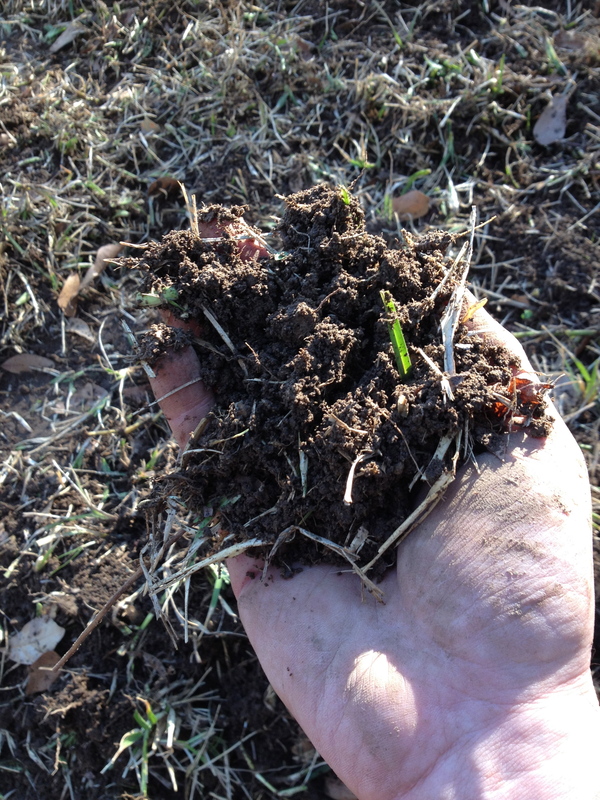 You can’t build tilth with minerals alone; you must build humus to create the environment for plants to efficiently process available nutrients. Proper humus assures adequate water retention, oxygen in the soil, and ease of root and fungal growth. This is done by rotating crops, plowing under green manure, adding compost and soil amendments, as needed. As he notes, plants grown directly above a limestone bed can show a calcium deficiency, but biologically available calcium is as much a product of good soil structure (in my opinion) as the ratio of other minerals that can be tested in the lab. It may be a question of which end of the microscope you are looking through; the goal — and ingredients — remain the same. But soil structure, humus, tilth, are issues that a organic gardener/farmer can readily see and control. To ignore that end of the equation may be just as much a “neglect” or “abuse” of soils as any scientific test may reveal. For the average gardener, what does this mean? Give your soil the love it richly deserves, using natural, sustainable and organic growing methods, and it will richly reward you with healthful, nutritionally dense foods. For gardeners in the South, now is the time to at least start planning your garden this year; if you grow organic, or raise bees, it’s maybe even getting a little late. Why so? If you’re a beekeeper, and you need to replenish a hive or start a new one, you should have ordered your bees in November. That’s sort of a traditional time to order, so that bee breeders can know what to expect. Moreover, if you wait until spring, all the available queens, nucs or packaged bees may be sold out. Regarding gardening, it’s somewhat the same story if you’re an organic gardener. You want to plant as early as possible after frost in order to try to get a leg up on the bugs. I usually start planting the week after Easter (in central Mississippi). With the permission of my landlady, I’m putting in a garden. 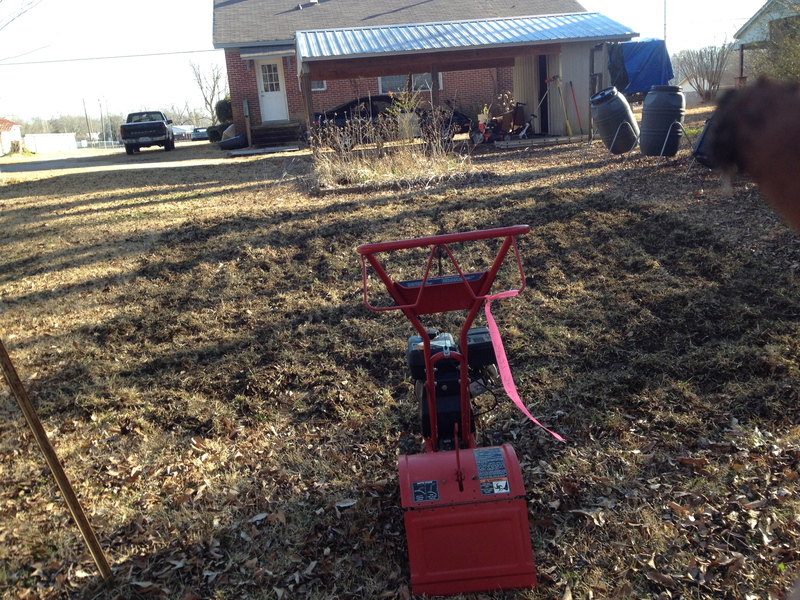 I managed to get a first pass with my tiller on January 31, to break up the roots of the turf grass. I’ll give it another pass in a week or so; then, add compost and till it. Not sure what I’m going to plant yet. I’ll send off a soil sample to get it tested and find out what it needs, if anything. Regardless, I plan to build up the soil with compost and might boost it with “green manure” (a cover crop). faces toward the sun. It can be a spiritual experience. fine. If it’s muddy, it’s too wet. It’s a careful balance. Plant roots need to be able to breathe in the soil. Drip and soaker systems are additional watering options for larger gardens. top soil with it) or evaporate as readily as water mist sprayed into the air. is a good idea if you plan to leave them out during the winter. end, lowest at the beginning. So say Tom and Kitty Stoner, founders of the TKF Foundation, and its Open Spaces, Sacred Places program that supports having natural oases in cities, neighborhoods and businesses. Today, Good Friday, is traditional planting time in central Mississippi. Given the oddly warm and even hot weather, it seems late to plant, but it’s not. The best time is just starting. Planning your garden is part of the fun, as well. You, too, can make your organic garden a welcoming place for others, or for rejuvenating yourself. That’s what gardens are all about, in my view anyway. They feed the body and the soul. Over next to our spring/fall garden plot, I have a reclining chair. During warm weather – even winter, if the sun is out – my beautiful wife Annette can frequently find me there, looking out over the rows and spirals of plants in the garden. In sunny weather, I watch the bees buzz from flower to flower while laden with pollen like they’re wearing waders. I watch the butterflies in their arrays of yellows, oranges and blues, flit here and there. And the birds drop from the sky to alight, eying bugs in the soft soil. We are serenaded by their birdsong. Sometimes, I take a book to read. Sometimes, I just hold the book in my lap, transfixed by nature’s unfolding tableau. The wonder is that these oases can be built just about anywhere, or everywhere. Perhaps, wherever the heart yearns for peace and a place that helps reveal the joy that resides within. Reader response: What liquid organic fertilizer do you recommend? How can it be applied? I don’t recommend any brand, but to get transplants and seeds started we usually mix kelp and fish emulsion or blood meal. You can take your seedlings and dip them in the mix and plant them, to give them a boost. Or dribble it around the roots for a topical dressing. Later, you can spray the kelp as foliar feeding. Check local garden stores’ organic sections. If they’re OMRI approved (www.omri. org), they should be fine. If you are vegan and don’t approve of using animal products, you can use mineral mixes with the same elements. Just read the labels or go online. Bottles of fertilizer are pricey, but they also go a long way; you don’t have to apply very often. Reader response: I heard someone say “plants can’t tell the difference between synthetic and organic fertilizer.” Is this true? Well, if you believe what the chemical companies tell you, that’s true. But if you call yourself an organic grower, no way! First: Synthetic fertilizers are banned in the National Organic Program. You cannot be certified organic and use them. Second, using synthetic fertilizers also is an affront to the basic philosophy of organics. Organic growing is from the soil up, not the chemical applicator down. Ammonia- based synthetic fertilizers kill microorganisms in the soil, kill earthworms that keep it aerated and fertilized by their natural processes,they burn plant roots and destroy humus. They weaken plants’ resistance to disease; which works out great for chemical manufacturers because they then can also sell chemical insecticides, fungicides and other poisons. That’s in the microcosm: your own backyard. In the macrocosm, they poison drinking water, kill lakes and cause waterways to choke with weeds; they even are responsible for the giant dead zone in the Gulf of Mexico where there is no oxygen. You can’t throw harsh chemicals on the soil and not expect consequences – in our food, yards or planet. •Chickweed (Stellaria media) dissolves cysts, tonifies the thyroid and aids in weight loss. •Daisy (Bellis perennis) relieves headaches, muscle pain and allergy symptoms. •Dandelion (Taraxacum officinalis) relieves gas, heartburn and indigestion. •Plantain, also called ribwort or pig’s ear, speeds healing, relieves pain, stops itching. •St. John’s wort (Hypericum perforatum) relieves muscle aches, is useful with shingles, sciatica, back pain and headaches. Reader response: Are genetically modified foods really a problem? I think that sums it up: It’s unregulated, possibly unsafe for humans, certainly a danger to the environment, morally questionable, and likely to make developing countries even more dependent on hand-outs or subject to starvation. California may vote on GMO: Polling shows 80 percent of California voters support labels on GMO foods. And they are starting a petition drive to put it on their Nov. 6 ballot. Organic and food safety interests will be watching; it’s likely, as goes California, so goes the nation. For more, see: http://organicconsumersfund.org. Don’t have much space for organic garden? Grow up! Folks who live in urban areas or apartments may sometimes feel left out of the grow-your-own organic food movement. Don’t! In addition to community supported agriculture, where churches, civic groups, neighbors and/or farmer/entrepreneurs often offer urban gardens, it may only take a little ingenuity to be growing wholesome, nutritious food. For example, pots or buckets on apartment balconies (even on high rises) can offer great spots for winter greens or summer tomatoes. For those with no yard to speak of, like a town house, if you have a garage, you can plant in a wheelbarrow and simply roll it out during the day and back in at night. But one of the most creative compendiums of ideas for the garden challenged is a new book: Vertical Vegetables and Fruit: Creative Gardening Techniques for Growing Up in Small Spaces by Rhonda Massingham Hart (Storey Publishing, $16.95). Although the book is mostly devoted to small plots, that is, people who have a few feet of actual ground to work with, it also gives ample instructions on other ways to grow in small spaces, such as using hanging pots, buckets and pruning techniques. It also gives good tips for varieties of plants, seeds and soil requirements. Maybe for some folks in urban or cramped quarters now is a good time to start planning for spring with a new outlook. In other words, it’s time to get vertical and grow up! Paula Deen’s larding it on: I’m disappointed that Paula Deen, who has made a fortune showing people how to cook fried foods, didn’t take the opportunity of announcing her Type 2 diabetes this week with a change of lifestyle. She could have made an impact in diabetes prevention. Instead she announced her illness saying that she’s actually had it for three years – and was unapologetic about her role in promoting unhealthy diets, saying that people should eat what they want. The point seemed to be her having inked a contract with a pharmaceutical company for an insulin alterative drug. But why not eat a healthy diet to help prevent diabetes to begin with? Taking her at her word, Deen achieved fame promoting unhealthy diets and now indeed must bear personal responsibility for her choice. She now will also be an example of what not to eat. Mississippians, listed as having the most obese people of any state and suffering all the ills of poor diet – diabetes, hypertension, cardiovascular disease, joint problems and reduced physical mobility – should take note. A balanced diet and moderate exercise can do wonders.